In the wake of the ballpoint pen’s appearance, some efforts have been made to respond to the perceived disadvantages of the fountain pen. I have elsewhere looked at a couple of efforts to redress the demand for a specific angle of writing. In the Vanishing Point (alternatively known as the Capless), another aspect of convenience has been seen to. “Oh, my,” cries the modern pen user, “the need to remove a cap is a terrible burden! 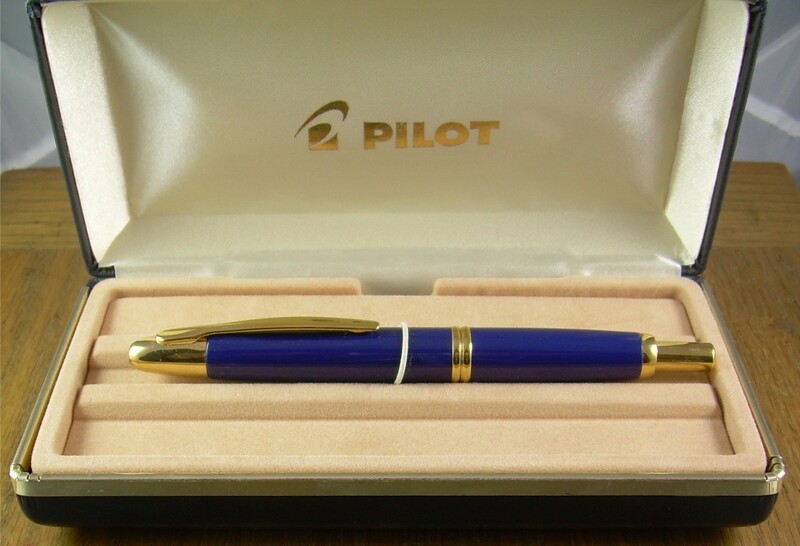 Ball points, like Parker’s venerable Jotter, have that sorted out!” Well, Pilot has done the same for fountain pens. This thing works like a ball-point, sticking its business end out at the press of a button. When done, pressing the same button releases a spring to withdraw the point, and the user goes about another busy day. There is one big difference between the VP and ballpoints of similar function– in the latter, the button is at the same end as the clip. This has the button hanging down into the pocket, so it takes either a little more dexterity in the draw or a willingness to poke the button into one’s own chest to extend the point; I generally opt for the latter, as it avoids the small act of prestidigitation to move one’s grip from the tail to the nose of the pen. There are other models, Pilot’s Fermo (which is, technically, a subset of Vanishing Point anyway) and Lamy’s Dialog 3, which twist to extend, but that takes you back to a two-handed gesture. Some earlier incarnations of the VP had a little slider on the side to work the mechanism, but the last of these appeared in 1968. When at rest, the point is hidden behind a well-recessed and evidently quite air-tight trap door. This and an o-ring at the strangely placed joint seal the pen quite well, and it can be neglected for long periods between uses, which I guess is another way in which is it like a ballpoint. I have slight worries about things like cookie crumbs falling into the point port while the pen rides in a pocket, but I’ve not managed to make a mess of it despite a habit of granola bar lunches. It is profoundly unlike a ballpoint in its writing. The point is very nearly as nice as a vintage pen’s, and the whole affair is marketed in North America by Pilot’s luxury division, Namiki. There are some who find that the placement of the clip is a great hindrance to their enjoyment of the pen, and that’s not an unreasonable objection. I find that with a very slight amendment of my usual hold, the clip doesn’t signify, but if you’re considering buying one, it’s a point to ponder. The other possible objection is that there’s so much mechanism inside the pen, there’s not a lot of room left for ink, especially with the provided piston converter. One can buy a squeeze converter with a little extra capacity, but it’s still not got a huge tank. My final sour note is that this modern example is brass-bodied and quite heavy– earlier models were lighter. In 2005, Pilot introduced the Décimo, a slimmer version of the current Vanishing Point, so called because it is the tenth variation on the Capless model and whoever was doing the naming at Pilot at the time liked Spanish. The same year also saw the appearance of the Fermo. Both were kept from the North American market for a couple of years, but as now generally available. For a rather more comprehensive look that this model, including actual pictures of previous versions, a look in at Carmen Rivera’s Vanishing Point Page will provide. Also, a look at this page and its off-shoots will give a very comprehensive picture of the pen through its various developments. Also, there is a nice cross-section view of the pen closed, deployed, and part-way at The Writing Desk’s FAQ section, which lays bare the mysteries of how the pen seals. Production Run: 1963 – present. Cost When New: When introduced, the price was ¥6,000 for the base model, or ¥10,000 for either a gold-plated or maki-e decorated body (about $17.00 or $27 at the time; for modern value, try this calculator, but remember that “Made in Japan” then was rather like “Made in China” now, and that the less expensive one represented a reasonable month’s pay in Tokyo). The price was dropped to more achievable levels the year after introduction, touching points as low as ¥1,000 for a student version. Current MSRP is ¥10,500 – ¥18,900, depending on finish. In 2014 a wooden-bodied version was introduced with an MSRP of ¥25,000. Size: 14.0 cm long retracted, 13.7 cm deployed (post-1999 model); Décimo: 13.9 cm retracted, 13.7 deployed. Point: 18k gold in North America; the lower-priced models in Japan are listed as having 特殊合金 points, which Babelfish informs me is “uniqueness alloy” from which I assume steel. Décimo and Fermo only appear with 18k. Earlier models were 14k. Body: Plastic, up to 1999, brass from late ’99 onwards, with wood cladding as an option from 2014. Filler: Cartridge, capacity approx. 0.8ml. Two different converters will fit, the CON-20 press-bar type (0.7ml) and the CON-50 piston type (0.5 ml). Pilot/Namiki Vanishing Point/Capless, metal-bodied late version; it looks smaller in pictures than it actually is. Decimo, which feels slimmer than it looks in comparison to the full-width model.